Electronic Arts VP Louis Castle talks about making and designing Boom Blox, using an indie development process at EA, the Wii remote, the game's level editor, and even head-tracking! If one of Nintendo's goals with the Wii was to inspire companies to step out of their comfort range and do new and different things, Boom Blox may be taken as a sign of success. Boom Blox will be the first game to emerge from the collaboration between director Steven Spielberg and EA, but Louis Castle, Vice President of Creative Development at EA Los Angeles, was quick to admit that it was the sort of game that people wouldn't expect from them. In his GDC 2008 lecture "Creating Spielberg's Boom Blox", Castle told attendees that game actually got its start after Spielberg had a chance to play the Wii at E3 2006. Afterwards, Spielberg talked with Doug Church, a developer at EA, inspired by the potential of the Wii's unique control scheme and also wanting to create a game that would bring kids and adults together. That was where the concept came from: the simple joys of building up blocks and knocking them back down. Castle talked about how both he and Spielberg did the exact same thing when they had received train sets. First they set everything up to run perfectly, and then they crossed the tracks to make a crash. Likewise, the three "razors", or tenets, that Boom Blox grew out of were "Learn, Destroy, Score." Early development for Boom Blox was atypical for an EA project. Castle showed a slide of EA's structured process for making games, called the Game Development Framework. This featured lots of documentation, phases for development to go through, and gates that would decide when it would move to the next phase. Castle told us that the process was great for weeding out lots of undesirables and only spending a lot of money on the games that survived the process, but that the process wouldn't work for Boom Blox. Instead, for many months Boom Blox was developed very indie-style: it had a small team, including very hands-on involvement from Spielberg himself, who rapidly experimented with different concepts. 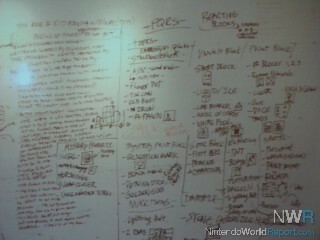 The game's entire game design document was scribbled on the office whiteboards. To begin with, the team spent a lot of time working with the Wii Remote to ensure that the game would really take advantage of its unique features. They felt that a common mistake was in merely measuring what users did with the Wii Remote. They wanted to make sure that, despite the variations in position and style, they'd be able to detect what users intended to do instead. What made that difficult was that the Wii Remote's accelerometers only gave three dimensions of information and the sensors could easily max out when users swung the device quickly. Showing a video graphing Wii Remote accelerometer data for different movements, Castle explained that for large movements there was a large deal of guesswork in what the user was actually doing since the Wii remote was moving too fast to give any usable data. 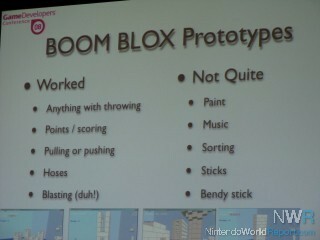 Castle also presented several videos of early Boom Blox prototypes. Ultimately, the development team "discarded many many more things than were kept", but there were plenty of ideas they tried out to see if they were fun or if they could work. Castle played videos of musical blocks, of poking and picking up blocks with a flexible stick, of blocks exploding, and even a video of a re-creation of a game of pick-up-sticks. But one of the things that was working from the very beginning was the game's physics engine. The developers had asked themselves, "Why not make a game about dorking around with physics?" and Boom Blox was the result. Ultimately, Boom Blox would be using the Havok physics engine. It would also use the engine from EA's Harry Potter games. With the Wii hardware tracking 600 objects, running a full physics simulation, and trying to keep a good frame rate and more, they needed to balance what they showed on the screen. The Harry Potter code base gave them code they could trust, a very fast renderer, and a full physics engine. Of course, they also had to strip out a lot of functionality that Boom Blox wouldn't use: Harry Potter it was not. Eventually, they showed the game to the rest of EA and experienced a lot of internal excitement. But in order to finish the title, they had to leave the indie phase and return to the way EA projects were traditionally run. This resulted in real growing pains because they needed to grow the team beyond the small core they had worked with for months. They were also bringing on specialists who required even more team members to manage them, and the severe lack of documentation from the game's radical design process came back to haunt them. Ultimately though, Castle expressed happiness with the end result, and was grateful to have the structure of EA's process. It would help guide the game to completion by its May 2008 due date. Castle even pointed out the Blox characters as a contribution by the larger team that really helped to improve the game. By this point, they were putting Boom Blox through focus testing and found out that there was a lack of emotional context for people to connect to. Spielberg's frequent input and commitment, which had been really intense early on, was also on a smaller scale at the time due to his work on the next Indiana Jones movie. But even before they read him the results from the focus testing, Spielberg's instincts nailed what was wrong with Boom Blox: "It would be great if this game didn't feel so lonely." Thus were the Blox characters born. Sheep and bears and other creatures who would provide context to the game's scenarios, cheer players on, or start messing with each other. Castle played EA's "Emotions" trailer to introduce some of the game's more than 30 characters, from zombies to sheep to baseball-throwing bears. He also demonstrated the game's "Remix" feature, where players could construct their own levels and scenarios easily and share them with friends online. He used it to show us how quick and easy it was to place Blocks and characters around the level, and to demonstrate how the game's characters each had their own behaviors. He then showed off how the game could pause, and how the user could move the camera around the time-stopped level even while characters were in mid-flight. Castle then talked about the game's naming. They didn't want to sell the game as a puzzle game because it really wasn't a typical puzzle game, and it had a lot more action than you'd expect. They didn't want to communicate it as a character game either. Ultimately, they felt that the title "Boom Blox" was a perfect fit. Finally, Castle finished off the presentation with a "GDC Exclusive Easter Egg" for the audience: a head-tracking mode! They'd played around with head-tracking before, but the recent fervor over the ability to move an in-game camera according to the position of the user's head encouraged them to implement the feature. In head-tracking mode, the first two Wii Remotes would function normally, but players would activate the third and fourth remotes and place them beside the TV. Then they'd use a wireless sensor bar, or tape some home-made LED lights to a baseball cap and by walking around they'd be able to move the in-game camera. There was some time left at the end of the lecture for attendees to come up and have some hands-on time with Boom Blox, so be sure to check NWR's coverage of the game here. I am becoming more intrigued by this title the more I hear about it. Great article Kairon!!! I have to confess that this title was not on my radar one bit until this conference. Here's hoping ya got a hit on your hands EA!